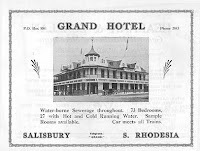 The old Grande Hotel stood in the centre of Salisbury on First Street until it was demolished in the 1970s and replaced by a bank. This was my first home in the country - in fact in Africa. My room was on the First Street side, right next to the fourth pillar along the first floor. My room had bed with a mosquito net and was painted white. All the linen was spotlessly white. The door leading to the first floor balcony was painted white and the top section was open with mosquito netting over the open section. It was October 1960 and hot. When I retired for the night I would close the door but was careful to lock it well. Each morning I would wake to find the door wide open! On some evenings I would hear sobbing coming from the balcony - I looked out onto the balcony on a number of occasions thinking there might be someone in distress on an adjoining balcony - nothing - no one at all. When I stepped onto the balcony the sobbing stopped. Was the Grande Hotel haunted - I am uncertain. I never felt any feeling of fear - even though I was in Africa first the first time and staying in a room with a door I could not keep locked and closed!